Access from Vail : Exit I-70 at Vail exit 176 and take the North Frontage Road west to Red Sandstone Road. Turn right and follow to the winter road closure gate and park here. Be aware that there is not a lot of space for snowmobile trailers, however. Attractions/Considerations : This road accesses Piney Lake at the foot of Mount Powell. The last 1/3 mile of this mapped route is privately owned by Piney River Ranch. Please respect their rules and be aware that they do run commercial snowmobile tours up this route. 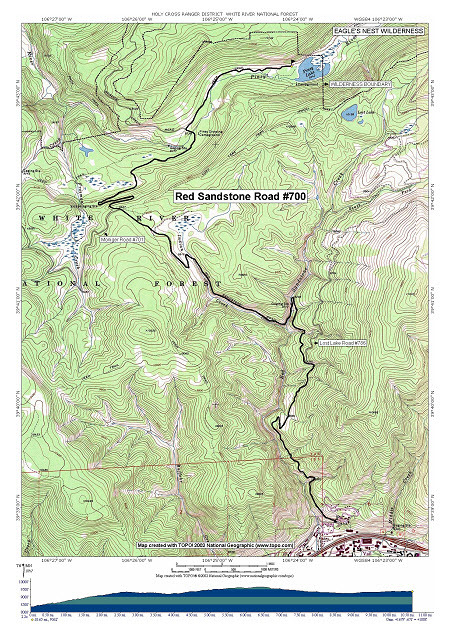 The Red Sandstone area consists of 63 miles of roads usable for snowmobiles. Any forest road in the area can be used except where signed for closures. Excellent views of the Gore and Sawatch Ranges are abundant. Trail Highlights : Follow the road about 2.7 miles to an intersection with the Lost Lake Road (#786) and continue left. At mile 6.5 you will reach another intersection. Here the Moniger Road (#701) will split to the left. Stay right and continue to Piney Crossing at mile 9.1 where the road crosses the Piney River then reaches one last intersection. Meadow Creek continues straight, but turn right to reach Piney Lake. Make sure to respect any signs when reaching the private property just before the lake.